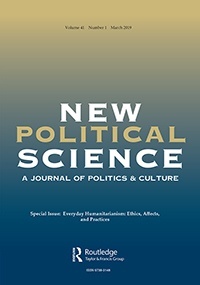 I am excited to say that our symposium (co-edited with Dirk Nabers) on Ernesto Laclau, IR and IPE has been accepted for publication in New Political Science, the official journal of APSA’s Caucus for a New Political Science! The symposium features contributions by Dirk Nabers on crisis, Eva Herschinger on war, Joscha Wullweber on money, Lasse Thomassen on representation and populism, Fränze Wilhelm on global order and myself on securitization. The symposium will be published in the June issue this year.